Star Wars is special, there’s no denying it. There is something so inspiring and encapsulating about George Lucas’ creation that millions and millions of people across the world adore. From when the original trilogy started back in 1977, through to the prequels, Rogue One and various incarnations of novels, television shows, games and much, much more; generation after generation fall madly in love with, arguably, the greatest franchise in a galaxy far, far away. In 2015, the creative baton was passed onto JJ Abrams, and he has masterminded a new series of Star Wars films that would be set after Episode VI: Return Of The Jedi. The trilogy would begin with Episode VII: The Force Awakens, bringing back old favourites such as lovable smuggler Han Solo (Harrison Ford), Princes Leia (Carrie Fisher), Luke Skywalker (Mark Hamill) and Chewbacca (Peter Mayhew, who has retired from the role due to injury and the mantle has been passed to Joonas Suotamo), alongside introducing new characters which included Rey (Daisy Ridley), Finn (John Boyega), Poe Dameron (Oscar Isaac) and Kylo Ren (Adam Driver). It was a triumph, ticking almost every box on a fans checklist as to what the film should have entailed. So, as you can imagine, many questions were left unanswered in this first instalment, so as Episode VIII drew nearer and nearer, minds were running at light speed and anticipation was sky high as to how The Last Jedi would unfold. For this article, there will be a vast number of spoilers and discussions about the film, hence why I have decided to publish the article a bit after release. So, I am giving you plenty of warning now and breathing space to click off the article if you haven’t seen the film. Once you’ve watched it, come back and see whether you agree with my thoughts or not. I’d hate for you to find out how the story line and film unfolds by reading this article, rather than experiencing it for yourselves, because I hate people spoiling it for me, and I feel by giving you plenty on warning, I won’t spoil it for you, and I can get my thoughts on it across. After the images below, there’s no going back! Last chance to click away before the discussion starts! BB8 on board an X-Wing. 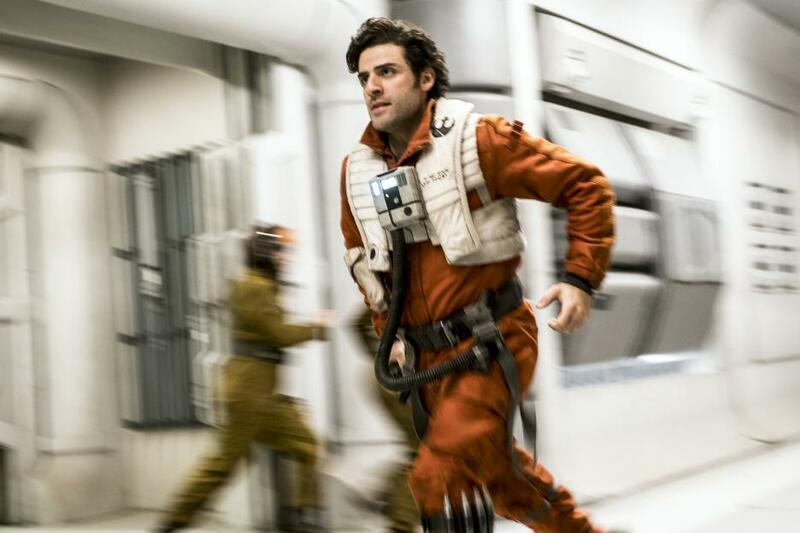 Commander Poe Dameron (Oscar Isaac) in his X-Wing uniform. Picking up shortly after the events of Episode VII, the Resistance, led by Princess/General Leia Organa (Carrie Fisher) and X-Wing Pilot Commander Poe Dameron (Isaac) are being pinned down by the ruthless First Order and General Hux (Domhnall Gleeson), but Finn (John Boyega) and maintenance worker Rose (Kelly Marie Tran) have travelled to find a way to halt them. Rey (Daisy Ridley) has found Luke Skywalker (Mark Hamill), but the beginning of her Jedi training isn’t as straightforward as she’d hoped, while a scarred Kylo Ren (Adam Driver) is under the guidance of Supreme Leader Snoke (Andy Serkis) and the dark side of the force. How can I describe this film? Bold, audacious, comical, loving, mesmerizing. For me, this film lived up to its expectations; so much so, I went and saw it twice on its release date, including the double bill midnight showing with The Force Awakens, and many times after that. I was completely in awe with everything that made it a fantastic Star Wars film. The story is well thought out, with a clear direction in which they wanted it to go, and they certainly did that. The way that there are 3 parts of the story that all conclude was well done, and writer & director Rian Johnson did a fantastic job in setting up the concluding leg which is scheduled to be released in 2019. It is easy to see why Disney has given him the reins on 3 more Star Wars films that will be going into development over the coming years. Kylo Ren (Adam Driver) poised with his unique lightsaber. The messages of the story are very clear, impactful and relatable on some level, making it a very personal film. I liked that not all the questions were fully answered, as it builds nicely for Episode IX. The bold and audacious aspects of the film, for me, paid off, as the sequel trilogy is focusing on different aspects, such as the components of the force, compared with the other films in the saga. What it also did, is project the films forward, as the main message is to let go of the past, and from this, I believe that we will see something like never before in the concluding chapter, and the praise The Last Jedi is receiving for setting that up is well deserved. What it also did excellently, like previous movies before them, is that the relationships they focus on meaningful and deeply connected. 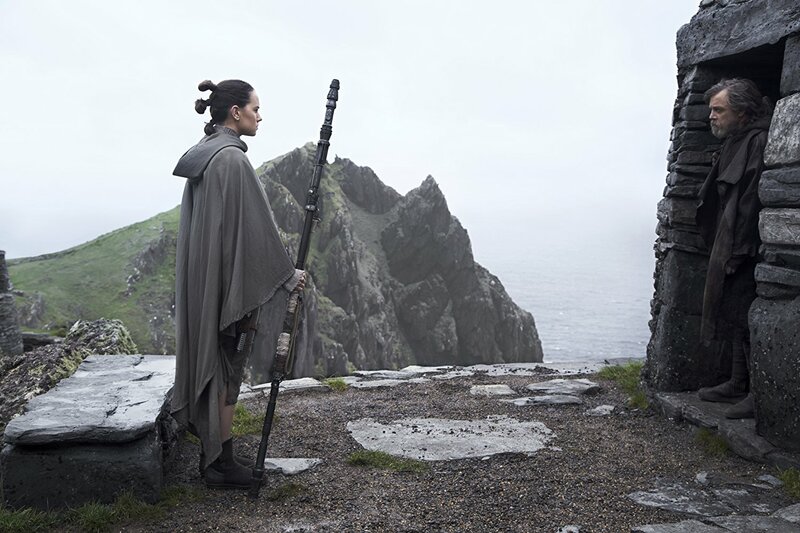 Rey (Daisy Ridley) confronts Luke (Mark Hamill) on Ahch-To Island. Mark Hamill is sensational in his full homecoming as Luke Skywalker, having an infinitely bigger role than his impactful silence at the end of Episode VII. His performance is deeply stunning as he combats the difficulties of his past with the challenges presented in front of him. It was a surprising and poignant moment when Master Yoda (Frank Oz) appeared to help Luke, which only enhanced the story, but is that a teaser for what is to come from Luke in the next episode? I do hope so. The late, great Carrie Fisher is phenomenal as ever, with of course, an extra tier of heartfelt emotion after she sadly passed away last year. It will be interesting to see how they deal with her role in the final chapter of this trilogy, but it was a loving and tearing touch that they dedicated this film in memory of her, as she has had, not only a cultural, but empowering impact on so many people. Due to a combination of great storytelling, especially for Rey and Kylo Ren, the newcomers of Ridley, Boyega, Isaac and Driver are just as brilliant, if not better, in their second outing than the first. Driver brings extra layers to Ren, deepening his understanding as we uncover more about why he turned to the dark side, and the conflicts he faces, while Ridley begins to hone Rey’s intentions of strengthening her powerful connection with the force. What some people disliked about the film, is that her parents are apparently two nobodies who sold her for drinking money, as Ren aptly puts it during a confrontation. What I adored about this, is that if this is true, and not just something Kylo said to manipulate her, is that she can finally let go, and rely on herself and the Resistance as she becomes a strong, independent character. But if it isn’t, I’m sure we will find out for definite in 2019. These two really are the driving force of the film, and they have undoubtedly become new Star Wars favourites. Boyega picks up exactly where he left off, while Isaac takes Dameron up a gear as he is tested to the limit. Supporting roles from new inductees to the SW Universe Kelly Marie Tran and Laura Dern as Vice Admiral Amilyan Holdo were wonderful, and Gleeson excelled in reprising his role as Hux. Carrie Fisher gives a great performance as General/Princess Leia in what ended up being her final film. The CGI is exceptional. The fluidity of the space battles and swiftness of the lightsabers are second-to-none. Combined with the use of practical effects and location shooting, this makes for the ultimate viewing experience, much like it did in Episode VII. The well-rehearsed and innovative action sequence that Rey and Kylo Ren deliver is one thing that all who have seen agree on; it was nothing short of epic, and will no doubt be regarded as one of the best fight scenes in Star Wars history. A lot of focus in the build up to this film was the introduction of a new furry little creature called Porgs that resonate on Ahch-To where Luke is hiding. While many are thinking they were a genius way for Disney to make an insane amount of money in merchandise sales from selling cuddly toy Porgs, they were inspired by and created due to Skellig Island, where they film, being inhabited by puffins, and it has been suggested that it was easier to CGI and puppeteer them into the movie than to be removed; winner, winner really. They actually integrate into the story nicely, interacting very well with Chewie and have become a fan favourite. John Williams did what John Williams does best, produce a pitch perfect score that imbues every scene with emotion and heart. He matches the tones of the film superbly, making every moment feel special as he has done for many years. The Porgs (right) aboard the Millennium Falcon with Chewbacca (left). However, despite the film being outrageously good, there are things I found disheartening at times. As refreshing as the comical elements were and I laughed at the majority, I felt a few were overplayed and unnecessary. It took away from some crucial, serious elements, like when Luke threw the lightsaber off the cliff. That could have been one of the deepest moments in Star Wars history if he had simply dropped it on the floor and pushed past a disheartened and confused Rey. But instead, it became kind of a cheap laugh. But for the most part, when comedy was used appropriately, it broke up the suspending and serious parts nicely. The odd scene was a bit confusing, and seemed out of place, but there were so many epic moments that they were soon forgotten about. In The Force Awakens, it was hard to develop all the characters, especially in a universe as big as Star Wars’. But the beauty of a sequel and subsequent pictures is that you have a chance to revisit characters, if appropriate, and allow them to blossom. The Last Jedi fails to do that with two specific players, Supreme Leader Snoke and Captain Phasma (Gwendoline Christie), who more than most, were in definite need of more screen time. For how terrifying and, for lack of a better term, but it is in his name, supreme Snoke is meant to be, we only saw glimpses of his power. While I enjoyed how his story concluded, I couldn’t help but think what might have been, or maybe even if we saw just an element of what he is ‘supposedly’ capable of, and how hyped he had become, fans would have been happier with him overall. Phasma had the look and potential when we first laid eyes on her to be as awesome and cunning as Boba Fett was in the original trilogy. The chrome armour and towering, intimidating figure are assets that should dominate the screen. Sadly, both The Force Awakens and The Last Jedi have failed her miserably, and it is a shame to see such a cool looking figure reduced to virtually nothing. Finn (John Boyega, left) battles with Captain Phasma (Gwendoline Christie, right). This film has its downfalls, I’m not disputing that for a second, but, as a massive fan of the franchise, and films in general, I loved it so, so much. The magic has carried on into The Last Jedi from The Force Awakens, and I thoroughly enjoyed the spectacle. I can see why the fanbase is split, and I can see why critics can’t get enough of it, and this film is a prime example of how film is so subjective. If you loved it, liked it or disliked it, that’s absolutely fine. But for me, it’s absolutely fantastic. The main plot points and character development of Luke, Rey and Kylo Ren are enthralling to witness, drawing you in with every turn. Rey and Kylo Ren have really become the face of Star Wars heading into the future, and fans, new and old, have new icons to idolise like Darth Vader, Obi-Wan and Yoda before them. The Last Jedi was a definite loved-it film, and the fact that we have to wait just under two years for the third and final instalment in this sequel trilogy will slowly pain me day by day, but I have no doubts it will be worth the wait. 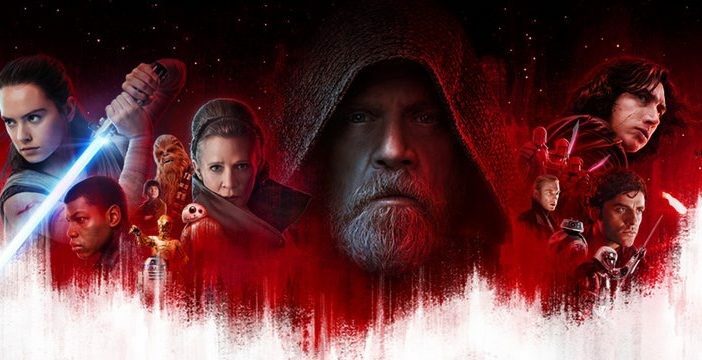 Star Wars: The Last Jedi is in cinema’s everywhere now, and is showing at Pontio from 14th-21st December, and 2nd-6th January.